Like many seaside areas of Massachusetts, Dennis has a sought-after beach on Cape Cod Bay. So much so in fact that access to one particular beach area is the subject of three appellate decisions. The seaside neighborhood in dispute consists of approximately 200 acres, which was developed into residential lots beginning approximately 1903. Generally, the inland property owners seek to confirm rights to access the beach through certain ways and rights to use private portions of the beach. The shorefront property owners seek to protect the beach in front of their homes from such use. The area is registered land, which often invokes different legal analysis than recorded land. The first appellate decision was published by the Supreme Judicial Court in 2015, and the second and third decisions were published by the Appeals Court on July 27, 2018. In the first case (Hickey I), the SJC determined that certain inland property owners had easement rights to use a way leading to the beach despite the fact that language on the certificates of title for the shorefront properties did not expressly, or through explicit reference, reserve any such easement for the benefit of these inland owners. The decision was somewhat groundbreaking in that the Court applied a particular easement analysis applicable to recorded land to registered land for the first time. Specifically, the Court allowed an inferential leap between the shorefront certificates of title to the inland certificates, a connection that was not explicitly referenced on the shorefront certificates or those documents specifically referenced therein. The Court concluded that shorefront property owners had a burden to review plans and certificates not directly referenced in their certificates of title because language on documents referenced on the certificate suggested that additional documents may affect their property rights. After making the leap to the additional documents, the shorefront owners would have been aware of easement grants in certificates of title for certain inland property owners. After the Court confirmed certain inland property owners’ rights to use the access way leading to the beach, the inland owners sought to effectuate the rights settled in Hickey I by constructing a walkway and stairs to access Cape Cod Bay and by confirming the scope of their beach rights. The inland owners prevailed in arguing that the shorefront owners lacked standing to appeal a conservation decision granting them authority to construct a walkway. However, the shorefront owners have another appeal pending that could affect authority to construct the walkway. Additionally, shorefront owners prevailed in the second Appeals Court case, where inland owners were found not to have private rights to use the beach in front of the seaside lots. As to the walkway, the Appeals Court determined that shared easement rights do not automatically grant standing to one easement holder to challenge the attempts of another to improve the easement through appealing a conservation decision. Specifically, shared easement holders can only challenge a conservation project through allegations that they have wetland-related concerns that are within the zone of interest protected by wetlands law. The court concluded that the damages alleged by the shorefront owners concerned the scope of the easement, a concern that was not implicated in conservation decisions. Accordingly, the shorefront conservation appeal was properly dismissed. This victory is limited by the shorefront owners’ other avenues available to challenge the proposed project and because the Appeals Court also concluded, on the same day, that even after the inland owners reach the beach, they have no special rights to use the intertidal beach area that lies seaward of the shorefront lots beyond those of the general public. Massachusetts is in the minority of seaside states that allow private ownership of intertidal beach areas. Such ownership is limited by reserved public rights generally known as fishing, fowling and navigation. The inland plaintiffs sought to confirm that they have rights to use this beach area beyond those reserved for the public. Applying the analysis in Hickey I, the Appeals Court rejected this argument because language on the applicable certificates of title would not have given any indication the inland property owners had such rights. Although not decided in the case, the court left open the possibility that inland owners may have full beach rights to the area of land that follows the trajectory of the access way in which they were found to have rights in Hickey I. 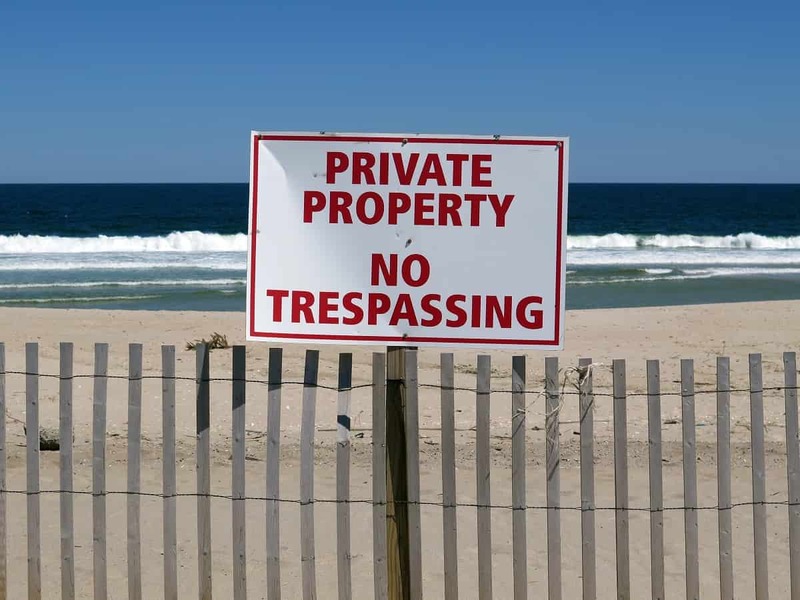 It can be a long, granular, and uncertain path to enjoy private Massachusetts beaches as an inland property owner, and it can be an expensive component of seaside ownership to protect private beach rights granted with ownership of the land. If you own or are purchasing property in a seaside development, please contact one of the Real Estate attorneys at Baker, Braverman & Barbadoro, P.C. to get the expert legal advice you need. – Kimberly Kroha.